Mennonite Brethren Bible School, 1949-1950 (South Abbotsford MB Church is in the background). 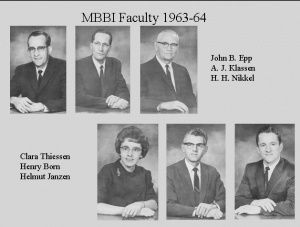 Mennonite Brethren Bible Institute (MBBI) was the expression of a denomination that placed a high value on biblical literacy. From the outset of their arrival in British Columbia, Mennonites quickly organized local congregations, and soon thereafter, Bible schools. Such institutions, it was felt, would shield young people against the prevailing secularism and also provide a generous supply of workers for local church ministries. Soon after the establishment of the South Abbotsford Mennonite Brethren Church in 1932, Kornelius H. Klassen called together a group of like-minded members for the purpose of planning a Christian school. This vision came to life on 26 September 1936 with the introduction of an evening program and Cornelius C. Peters, a European trained teacher, as the first instructor. Some 30 students enrolled for classes that first winter. The South Abbotsford Bible School functioned until 1941 when owing to World War II, classes were suspended. However, war conditions did not dampen the enthusiasm for Christian education. In 1943 a vacated tabernacle on Marshall Road was purchased for the purpose of starting a new Bible school and moved onto the South Abbotsford MB church property. Following the appointment of Franz C. Thiessen as principal and Wilfred Reimche as instructor, the school, now called Bethel Bible School, was given a more permanent basis. With the introduction of a day program there followed a decade of steady growth. In 1944 Jacob F. Redekop was appointed principal, continuing in that position for nine years. Under Redekop’s leadership a four-year course of studies was introduced and then further enhanced by a "post-graduate" fifth-year program. In the process of expansion Bethel gained the support of six Abbotsford area congregations: South Abbotsford, East Aldergrove, Clearbrook, Abbotsford, Matsqui, and Arnold. A high school program that had been added to the school in fall 1944 became the Mennonite Educational Institute in 1946. By the 1947-48 academic year the school's name had changed to Mennonite Brethren Bible School. In 1948 the first graduates of the Bible school provided the evidence that the school indeed represented a valuable investment as these students took on ministry responsibilities in local congregations and in the wider mission of the denomination. By the end of the decade, the school calendar listed some two-dozen courses including Bible doctrine, Old and New Testament surveys, Church history, missions, music and Sunday school teaching. A weekly radio program informed the constituency about the school but also served as source of inspiration and evangelism to loyal listeners in the Fraser Valley. Abram H. Wieler, the long time MBBI teacher and radio speaker, became widely known as the voice of the Bible school. The school moved from its location on the South Abbotsford MB church property to Clearbrook in 1955, when the Bible school society purchased land on Clearbrook Road and erected an administration and classroom building. The building, built at a cost of $27,000, contained four classrooms, a library, a basement auditorium, two recreational rooms, and office and administrative space. By the end of the 1950s several smaller Bible schools throughout British Columbia were no longer viable operations, and effectively merged into one school, the Mennonite Brethren Bible Institute (MBBI), owned by the British Columbia Mennonite Brethren Conference. Prominent teachers of these years included Jacob Redekop, John B. Epp, Henry H. Nikkel, Abram H. Wieler, George Konrad and Henry C. Born. The social turbulence and urbanization of the 1960s did not leave the Bible school unaffected. Restless students demanded a higher quality education and a more engaging learning experience. In response, the Board created dormitory space by purchasing and relocating a building from the Abbotsford Airport that was formerly used an a army barracks in 1962, followed by the construction of Redekop Hall in 1966 and Centennial Hall in 1967. A new administrative building with a chapel, classrooms, offices, and music rooms was completed in 1967. A student-life program along with increasing athletics was also introduced as a means of enriching campus life. Moreover, during the presidency of Henry Born, serious consideration was given to academic accreditation with the American Association of Bible Colleges. In this milieu, a historic development was about to enfold. By the late 1960s the Conference of Mennonites in British Columbia were encountering a diminishing enrollment in their denominational school, Bethel Bible Institute. The result of a laborious and sometimes contentious study process suggested that the Conference of Mennonites and the Mennonite Brethren Conference close ranks and amalgamate the two schools into a single institution with a common board governance. Long-standing suspicions notwithstanding, Columbia Bible Institute began its life in the fall of 1970 with Peter R. Toews as President and a full-time enrollment of 186 students. Never before had these two Mennonite denominations united in such a vital enterprise as the theological training of their young people. Born, Hilda J. "Columbia Bible College: Growth in Wisdom and Service." 1992. "Columbia Bible College Self-Evaluation, 1980." Self Study Document submitted to the American Association of Bible Colleges, 1989. Guenther, Phil. "The Story of Bethel Bible Institute." 1985. Schmidt, George. "Columbia Bible Institute: Paradox of a Brotherhood and Walls." University of Western Washington, 1977. Giesbrecht, David. "Mennonite Brethren Bible Institute (Abbotsford, British Columbia, Canada)." Global Anabaptist Mennonite Encyclopedia Online. October 2010. Web. 22 Apr 2019. http://gameo.org/index.php?title=Mennonite_Brethren_Bible_Institute_(Abbotsford,_British_Columbia,_Canada)&oldid=155489. Giesbrecht, David. (October 2010). Mennonite Brethren Bible Institute (Abbotsford, British Columbia, Canada). Global Anabaptist Mennonite Encyclopedia Online. Retrieved 22 April 2019, from http://gameo.org/index.php?title=Mennonite_Brethren_Bible_Institute_(Abbotsford,_British_Columbia,_Canada)&oldid=155489. This page was last modified on 26 October 2017, at 19:52.